Atoms For Peace are on the verge of finally dropping their debut album Amok late next month. It has been an album that has been rumored about for years now and is finally going to see the light of day. 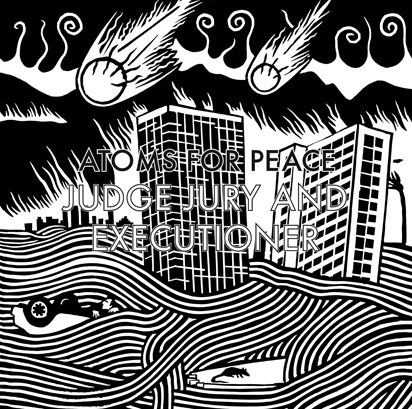 Take a listen to the new single 'Judge Jury and Executioner' below and you get a feel for what Thom Yorke does best, in providing dreamy, mysterious songs. There will also be a B-side to the single titled 'S.A.D.'. Atoms For Peace is made up of Thom Yorke, Nigel Godrich, Flea, Joey Waronker, and Mauro Refosco, as they all got together to help play Thom's The Eraser record live a few years back. Things fell into place for the group and they developed a great chemistry while playing the songs live, and rumors of them creating an album under the name Atoms For Peace have always been hanging out there, and now they are a reality. Thom says it best... "Atoms is a ongoing and open ended project, where it leads i know not for certain .... which is what is nice about it".